Honoring a visionary & pioneer. To honor Henri's legacy and celebrate his many contributions to a thriving industry that he helped build, a number of Henri's friends and industry leaders have come together to form the Henri A. Termeer Tribute Committee, co-chaired by Robert Coughlin, CEO, MassBIO and John Maraganore, CEO, Alnylam, working closely with Belinda and Adriana Termeer. A number of industry leaders have joined forces to form the “Henri A. Termeer Tribute Committee” with the mission to commemorate Henri Termeer’s remarkable stewardship of the local biotech industry and his undeterred commitment to revolutionize the care of patients afflicted with rare diseases. The committee, co-chaired by Robert Coughlin, CEO, MassBIO and John Maraganore, CEO, Alnylam Pharmaceuticals, has launched a campaign to pay tribute to Henri with initiatives that include renaming of the “North Plaza” in Kendall Square to “Henri A. Termeer Square,” commissioning the renowned sculptor Pablo Eduardo to create a life-size statue of Henri to be installed in the Square in 2019 with improvements to enhance the function and collaboration of the area, and the establishment of a mentorship initiative in Henri’s honor. We will provide occasional updates on the Committee's progress, which you can see here. 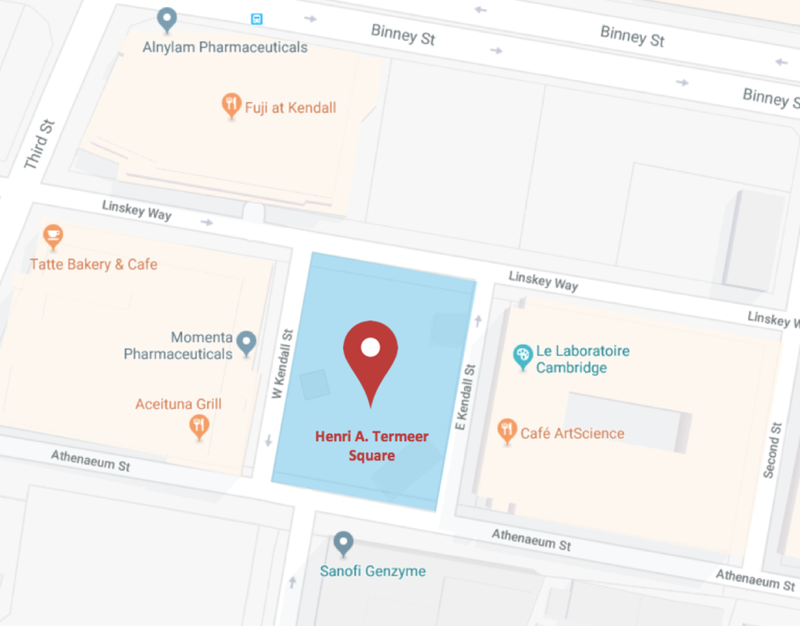 To help fund the ongoing and upcoming initatives, the Henri A. Termeer Tribute Committee has established a fund at the MassBioEd Foundation, a 501(c)(3) public charity. Donations in any amount and your generosity are greatly appreciated. Contributions in the following tiers will receive special recognition. $50,000 - $99,999 "Patient Champion"
The Henri A. Termeer Tribute Committee would like to thank the following individuals and organizations for the generous contributions to this initiative.